You really loved a post about Fall/Winter trends, so I decided to do a one for Spring. I'm so over winter and cold weather! I'm craving warmer days and lighter clothes. We had a few of them as a reminder that spring is going to come. I wanted to share a few of my favourite trends for Spring with you and some of my wishings. ➳ Ruffles - Do we have to talk about this? :D I don't think so! You already know everything (you saw them here, here, here and here). I love everything about them. I'm even more excited designers started making blouses with ruffles and stripes. You probably started seeing them. Rich ruffles around the neck and shoulders. Just imagine long skirts with ruffles or dresses. Love love loove ruffles! They are so feminine and classy! ➳ Stripes - They will always be on trend. I love them, they are so easy to style and they look so classy and elegant. But, this season is going to be more vibrant and colorful because besides classic cris-cros black and white stripes, we got vibrant and colorful stripes. They call them 'Bold stripes'. In the last post we talked about modified houndstooth pattern and here we have the same situation! Modified, vibrant and fun! I will be wearing both of them, for sure. ➳ Florals - Groundbreaking, I know. There is nothing more beautiful than flowers in the Spring. This sounds so damn cheesy, but it's true! Flowers on jacket, jeans, blouse, bag..Everywhere.. I already ordered a jacket and a bag that are covered in flowers and I can't wait for them to arrive! 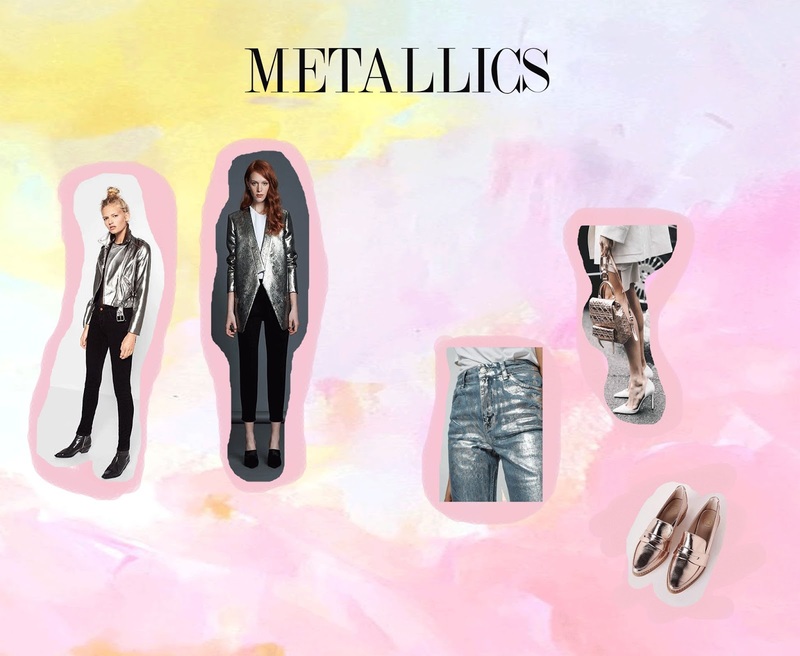 ➳ Metallics - 80's vibe will remain in the spirit of Spring and I'm totally in! I bought a pair of metallic heeled loafers in bronze (and I just ordered one more pair of gold metallic heels, I'm so guilty, but heey It's a sale on Asos - check it out if you didn't), but I want to find bronze and pinkish ones as well, oh I want them all!! If you pick any item in metallic, you won't be wrong. They are just all statement pieces. What are your favourite trends for Spring? So excited for Spring! Yay for ruffles and florals!! I am loving all the stripes for this spring!! I can't wait for warmer weather! I am excited about all the trends and am planning to incorporate it all this Spring! I love all that yellow! It's so pretty and feminine! Can't wait for the weather to finally warm up! OMG, blue and yellow is the best combination! Thanks for inspiration! I have to find something in this hues! I love following along with all the trends. This is an awesome list. Aww amazing sharing Ana! I'm a fan of ruffles and metallics now and I do have a few stripey pieces in my wardrobe. So excited for Spring fashion ;) Tks for sharing! Amazing post! I really love metallic and ruffles! i've just bought a metallic skirt! I'm really excited for spring ! I love everything I see and this post makes me want to go shopping. I am most excited for the metallics and the florals ! You know I've actually been so into ruffles this season! It was perfect for winter too because we're all bulking up anyways we mind as well as some cute detail in our outfit! 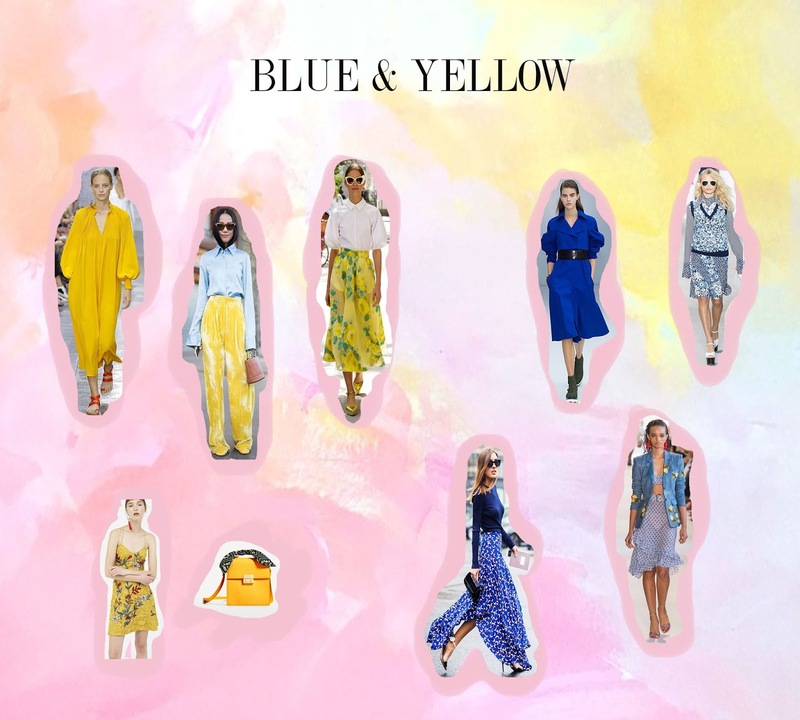 The blue and yellow trend is not one i've actually seen but honestly I love colour blocking and that sounds like such a fun statement wear! Florals and ruffles are my favourite trends this season, I can't wait for spring to wear all of my new floral dresses, that I've ordered recently!!! Great post, sweetie!!! Thanks for sharing it! I love chunky colours and everything metallic! What's your fave babe? I'm so excited about news. This is such an inspirational post! I really love the top right outfit on the first photo! Seriously my perfect look! I'm loving all of these trends! I especially am loving anything the is more bold be it color or the shape of the garment! I'm actually really digging metallics and stripes right now. Which is weird cause I normally just wear neutrals. Love this guide. So helpful. 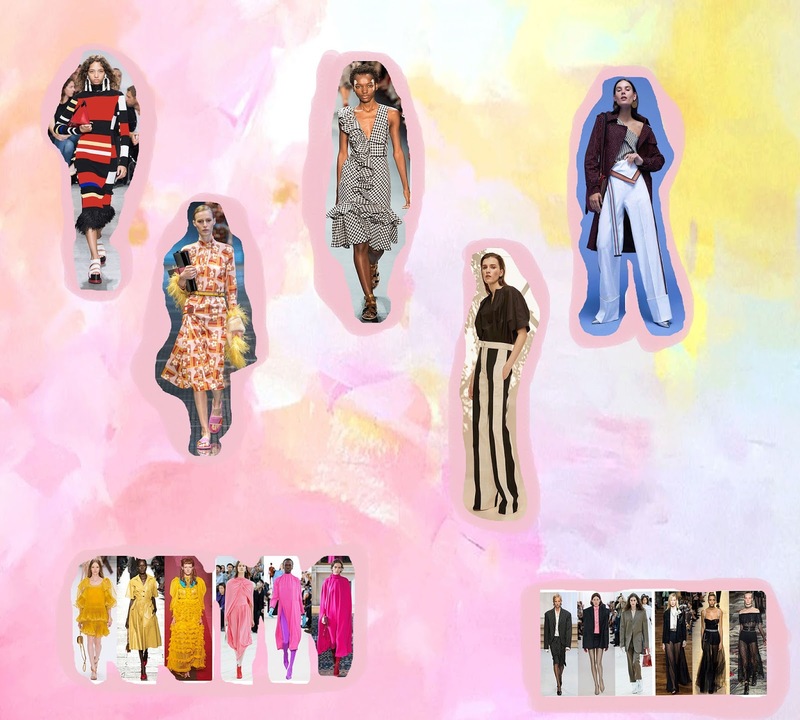 Loving your artwork for all of these spring trends! 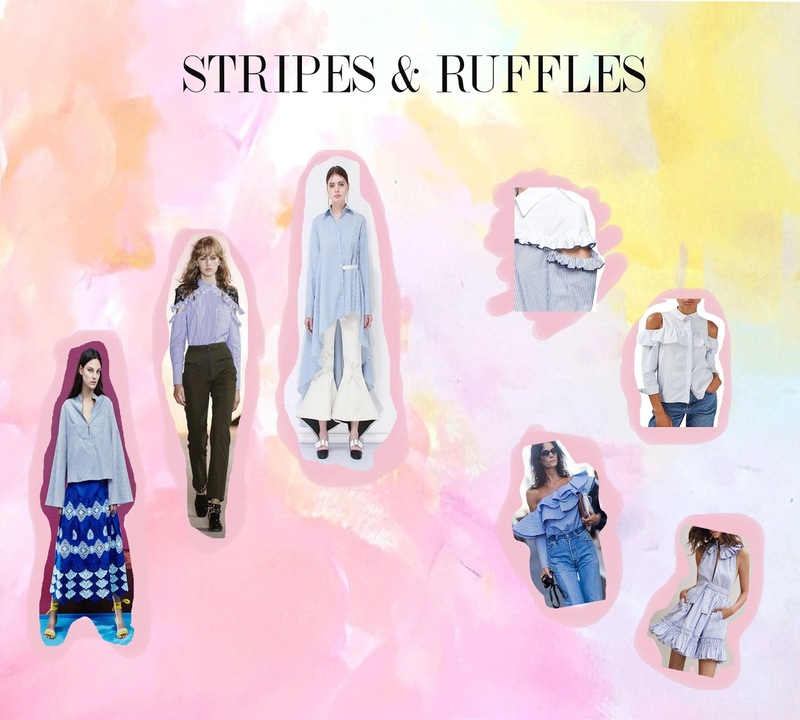 Stripes are always a classic for spring and ruffles add a really fun touch! Stripes and Ruffles are my must for this spring and summer. i have been looking around for it online! im so excited as these are my favorite season of all time! Fall and Winter seems to take forever and spring and summer seems to go by fast. Stripes and Ruffles are my must for this spring and summer.